As I approached the ivy clad ruin from the modern graveyard, my expectations were not very high. 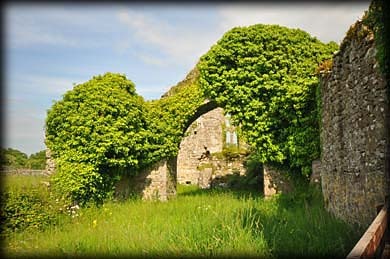 All that remains of the nave are the north and south walls, both of the outer sides were covered with ivy. The chancel looked much more promising and on closer inspection I found some interesting features. Through the chancel arch I could see the east gable. The window in the gable was quite revealing. 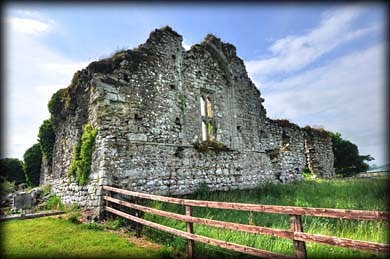 It showed evidence of three building phases. 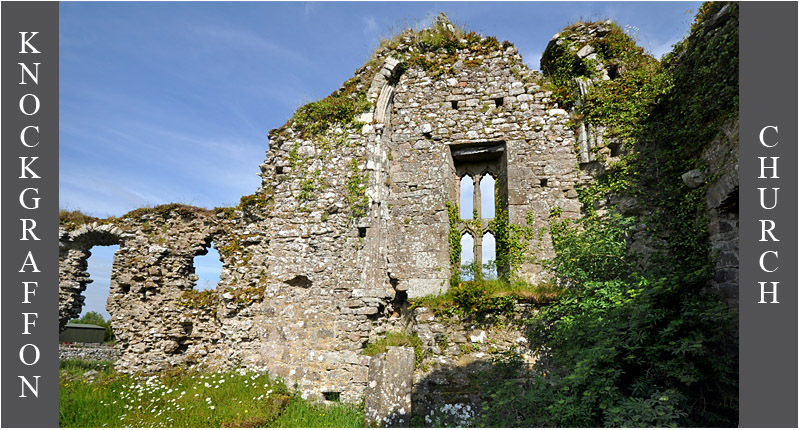 There was originally two lancet windows and these were replaced in the 13th century with a large round-headed window. You can see the moulding around this window in the top image. In the 15th century this window was blocked up and the present window was inserted. Another interesting feature are the two projecting corbels at the southeast angle of the church. The corbel projecting south bears the carving of an exhibitionist figure. It shows a head between two possible legs or arms. 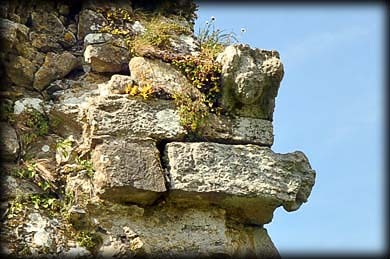 The corbel below also bears a badly worn carving, facing east. The Norman motte and 17th century tower house can be viewed from the graveyard. 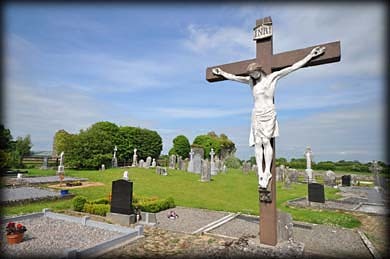 Situated: From Cahir take the R690 north for about 3 kilometres. Turn right onto the N24. Then 200 metres take the first exit at the roundabout. Next roundabout 3rd exit and final roundabout 2nd exit. Stay on this road for 1k before turning left. The church is about 1.5 k down this road just beyond the motte. Discovery Map 74: S 0457 2917. Last Visit: June 2015.